The night her parents disappear, twelve-year-old Robyn Loxley must learn to fend for herself. Her home, Nott City, has been taken over by a harsh governor, Ignomus Crown. After fleeing for her life, Robyn has no choice but to join a band of strangers—misfit kids, each with their own special talent for mischief. Setting out to right the wrongs of Crown’s merciless government, they take their outlaw status in stride. But Robyn can’t rest until she finds her parents. 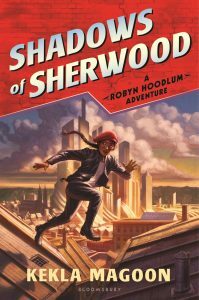 As she pieces together clues from the night they disappeared, Robyn learns that her destiny is tied to the future of Nott City in ways she never expected.